allowed direct mounting of accessories, such as fore-grips and flashlights, with no rail interface needed. 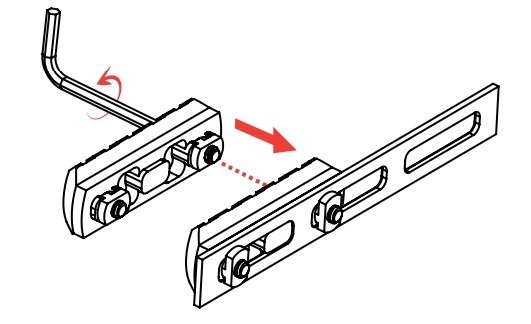 The MOE system was never officially released as an open standard, and the requirement to have access to the back side of the mounting surface limited its application. back side access to the mounting surface. 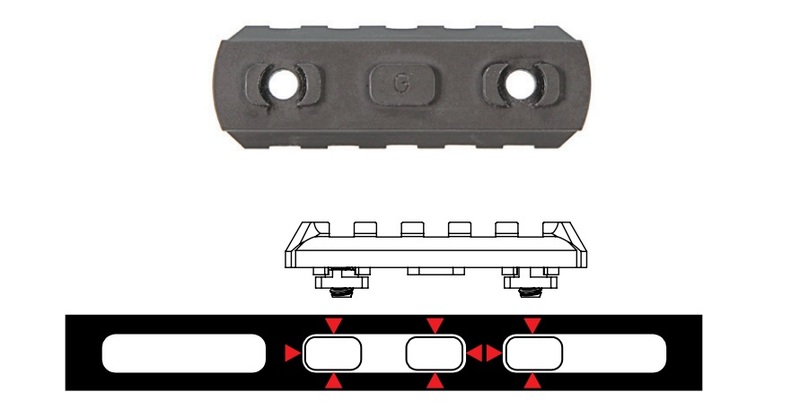 Rather than documenting and publishing the existing MOE slot information and weld nut system, Magpul engineers used this opportunity to substantially improve the feature set of the MOE system. The result is the M-LOK. Accessories are mountable directly from the front face of the slot. No access from the rear of the system is needed. with the slot, and insert in the desired location. An initial ¼ to ½ turn of the screw for each T-Nut rotates the nut into engagement and then you may tighten normally. The M-LOK slots require no special cutters or angle gauges in the manufacturing process. With injection molding, the lack of an undercut allows simple mold design. All of this results in the lowest manufacturing costs possible. Accessories feature recoil mitigation lugs with full recoil lug support in all 4 axes of movement, preventing movement of the system under recoil or rough handling, allowing repeatable accuracy in removal and reinstallation. 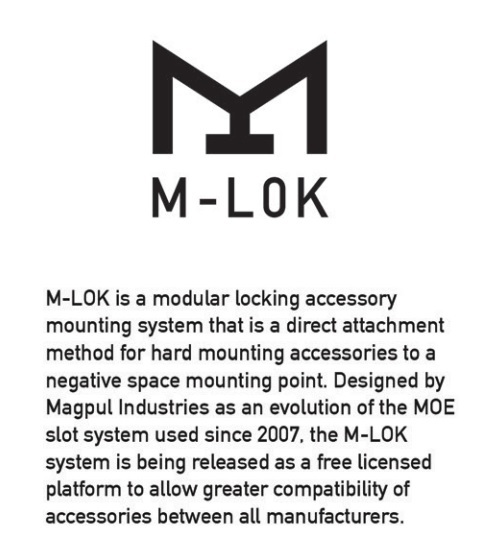 M-LOK accessories can be direct mounted entirely within a slot or bridging between/across slots, making the adjustment interval smaller than the size of a single slot. 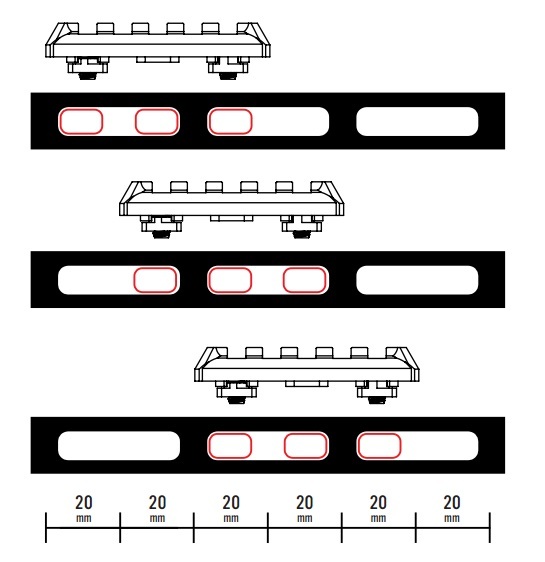 (Intervals equal two Picatinny rail slots (20mm) of adjustment). Full, 4 axis recoil lug support is maintained at every interval. 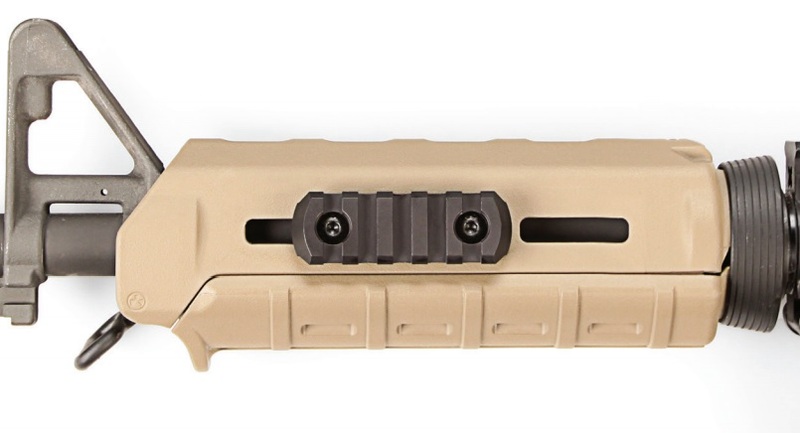 Accessories can be mounted facing toward the front or the rear (180 degrees difference), with full recoil lug support—the system does not need to be oriented in a specific direction to function properly. 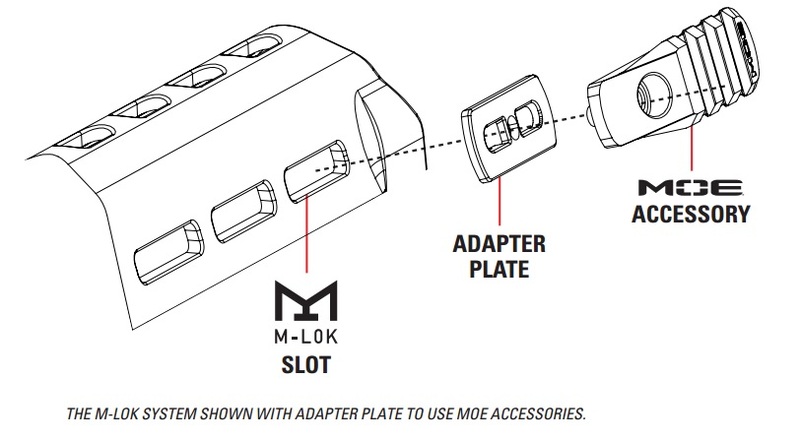 In addition to the soon-to-be released, dedicated M-LOK accessory line, current MOE accessories will work with the M-LOK slots via an adapter plate, giving the M-LOK system access to millions of accessories already fielded for the MOE system.